About Connecticut Shotgun Mfg. Co.
Connecticut Shotgun/Galazan was founded in 1975 by our current president and founder Antony Galazan. Connecticut Shotgun is located at 100 Burritt Street, New Britain, CT. The company has nearly 3 acres of manufacturing space. We are a small privately owned company that is focused on double gun making. Connecticut Shotgun manufactures the A. Galazan full sidelock over & under shotgun, the A.H. Fox shotgun, the Winchester Model 21 and the Connecticut Shotgun Model 21, our Full sidelock side by side A. Galazan, the Parker shotgun for Remington, and the RBL line of shotguns that is available in 12,16,20 and 28 gauge as well as a double saboted slug gun version. In addition, we manufacture these guns on a very limited basis: The Model 21 .22 caliber double rifle, A.H. Fox .22 double rifle, and Model 21 big bore rifles. We also took over the Custom Shop from US Repeating Arms Co. for the Model 21. 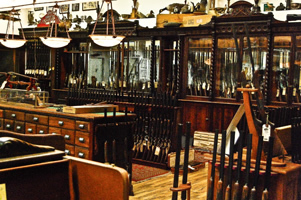 We have an extensive inventory of used shotguns from all over the world which we buy and sell very actively. Our product division carries many hard to find proprietary shotgun products; over 3000 different items, many available exclusively through Connectiucut Shotgun. In 2008 Connecticut Shotgun Mfg. Co. became the sole distributor of the B. Rizzini line of high quality shotguns.